Well, so much for that whole getting younger thing the Ravens wanted to do. Over the weekend, the Ravens signed two familiar faces of Offensive Coordinator, Jim Caldwell. 37-year old Brandon Stokley and 34-year old Dallas Clark. It’s a move that spells out desperation. But that’s ok. The last time the Ravens made a move out of desperation, Jim Caldwell was named the offensive coordinator in Week 15. That turned out well for everyone, didn’t it? It only took one preseason game full of dropped passes and apparently one really bad practice which followed for the staff to decide that trotting out Deonte Thompson, Tandon Doss, Visanthe Shiancoe, maybe even Jacoby Jones as the #2 WR on the chart, would not be putting the Ravens in the best position to win football games. That’s what it’s all about. Coach Harbaugh had to fire his good friend, Cam Cameron, because coach needed “to put his team in the best position to win.” This move, to sign these two aging veterans, is what they feel gives them a better chance to win more games this year. Let’s look inside the numbers, starting with an old favorite, Brandon Stokley. Stokley will forever be etched in Ravens lore as the answer to the question, “who scored the first TD in Ravens Super Bowl history?” After stints in Indy, Denver, Seattle, New York, and back to Denver, he’s right back where it all started. The Ravens certainly needed to address the play over the middle of the field. 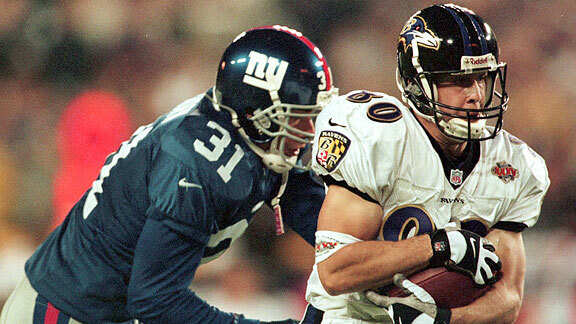 Brandon Stokley will be asked to replace Anquan Boldin, as the go to guy for those tough yards. First thing that stands out, only two dropped passes. I think Deonte Thompson had that in the first quarter of the first preseason game. Two dropped passes all season. At age 37, Stokley still has reliable hands, and isn’t afraid to go over the middle and sacrifice his body, evident by the 22 catches on 27 targets over the middle under 10 yards, where menacing linebackers like to hang out. He also loves the deep ball down the right side of the field. What stands out here is the percentage of targets that didn’t result in catches in the shortest yardage range. Lack of separation is the one knock on Anquan Boldin’s game. Maybe this proves it. Boldin caught 63.5% of balls under 10 yards. What are supposed to be the high percentage, move the chains passes. Granted, a smaller sample size, but Stokely caught 86.1% of said passes. Given an increase in targets, can Brandon Stokley not only replace, but possibly put up better numbers than Anquan Boldin? Now we’ll take a look at Dallas Clark, and who he’ll be expected to replace, Dennis Pitta. Clark had his best season in Jim Caldwell’s first season as the Colts head coach in 2009. He caught 100 balls for 1106 yards and 10 TDs. Injuries set him back in 2010 and 2011. He got a fresh start in Tampa for 2012 at age 33. His numbers fell well short of that spectacular 2009 campaign, but he was still serviceable. Also, Josh Freeman is no Peyton Manning. Interesting find here, Dallas Clark doesn’t stray too far off the line of scrimmage. Even in his great season of 09’ he only caught three balls on eight targets over 20 yards. That leads me to believe that if defensive players do their homework, Clark shouldn’t be driving linebackers to drop back in coverage with long routes, opening up the underneath for Ray Rice to do damage in the open field. If I’m a LB, I’m staying home if Clark runs by me, because it’s not going to him. What catches my attention here is that Pitta had his greatest success short and to the right. Clark had his greatest success short and to the right. Flacco obviously likes to go that way. Clark may not replace everything Pitta brought to the table as far as stretching the field goes. But like Pitta, he has great hands, and he’s a great chain mover. On routes under 10 yards, Dallas Clark catches 73.3% of balls thrown his way. Dennis Pitta caught 78.5%. Pretty close. If you’re any of these young receivers who haven’t made the most of limited opportunities, you have to feel like another year of making a name for yourself has gone by the wayside. I see no reason why Brandon Stokley and Dallas Clark shouldn’t step right into the upper portion of the depth chart. Flat out, they’ve earned it, and the young guys gave it away. The Ravens offense just got a little bit better.